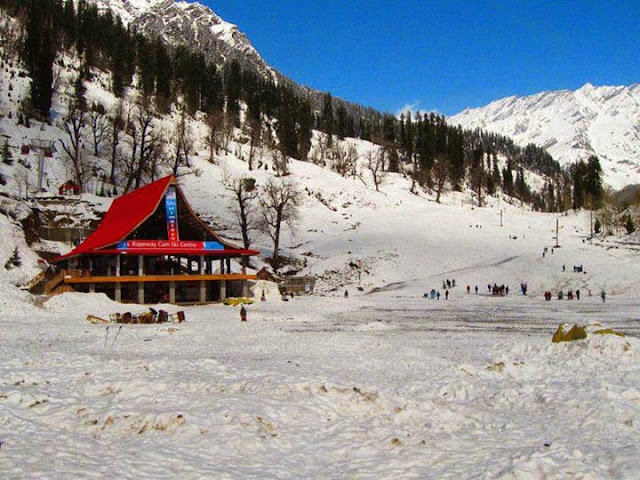 Solang valley is located around 14 kms from Manali and it is one of the best tourist attractions of Kullu Manali. This beautiful valley is famous for ski slopes and adventure activities or you can say it is an adventure hub of Manali. Beautiful view of Friendship peak is also available from the valley. This place is covered with snow during winters. You can enjoy skiing, paragliding, horse riding, zorbing, snow scooter, mountain biking and yak ride also in Solang Valley. During winters after snowfall Solang Valley hosts State and National level winter sports. Near the ground there are few ski centres and one of them is managed by Atal Bihari Vajpayee Institute of Mountaineering and Allied Sports. Short trek of Anjani Mahadev Temple is also starts for Solang Valley. Rope of Solang Valley also adds advantage to nature lover. For accommodation there are few cheap and budget hotels available in Solang Valley.